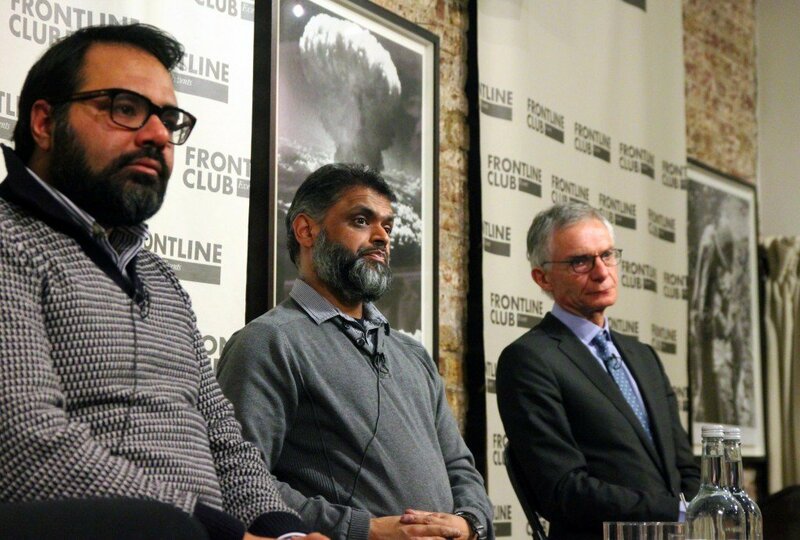 Shiraz Maher, of the International Centre for the Study of Radicalisation, King’s College; activist Moazzam Begg, and Richard Barrett, senior VP at The Soufan Group. At the Frontline Club on 14 January, Shiraz Maher, a senior research fellow at the International Centre for the Study of Radicalisation and Political Violence (ISCR) at King’s College; Moazzam Begg, a former Guantánamo Bay prisoner turned activist with the UK group Cage; and former MI6 director of global counter-terrorism Richard Barrett, now a senior VP with security consultants The Soufan Group, joined CBS News foreign correspondent and the evening’s chair Clarissa Ward for a discussion on the fate of Syria’s foreign fighters. The panel largely debated how an understanding of returning fighters’ motivations should inform the UK’s response, both in terms of new laws and de-radicalisation programs. The reasons why more than 500 foreign fighters have travelled from the UK to fight in Syria are as numerous as the numbers who have gone. But there are similar threads running through individual narratives that should inform the government’s response, said Maher. The current media narrative driven by Home Secretary Theresa May says that ‘if you go to Syria, you’re automatically deemed to be a terrorist,’ Maher argued. If there are legitimate threats among returning foreign fighters, why shouldn’t the government get tough with news laws that strengthen existing antiterrorism legislation? There are about 20 countries throughout the world running de-radicalisation programs for returning fighters, including the UK. Many adopt very different approaches with varying degrees of success. “The people who are going to be radicalised are the people who are young, people who are vulnerable, and people who are ideologically or sympathetically attached to what’s happening there,” said Begg, adding that getting people who have travelled to, and fought in, Syria to talk to returnees is a good step.